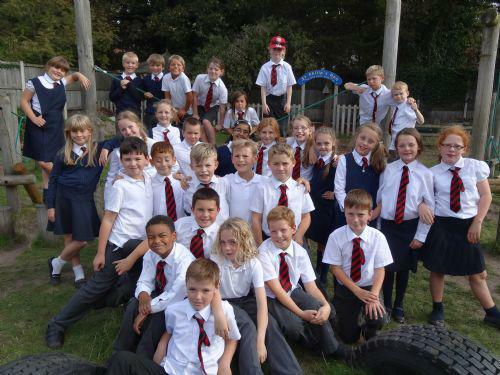 We hope you will find lots of useful news and information on our class page. Below, you can find our curriculum map for the year, our Summer Term timetable and this term's newsletter. We are looking forward to another great term's work. Many congratulations to our ten finalists and a special mention to Molly who spoke so confidently about her love of Roald Dahl books. We had a wonderful workshop last week at Greenbank High School, developing our own newspapers. We have a very busy end to the term coming up. On Wednesday July 8th we have been invited to Greenbank High School all day to take part in an exciting writing workshop. Please drop your child at Greenbank by 9.00am and you may collect them from there at 2.30pm or from St Philip’s at the usual time of 3.20pm. They will need a packed lunch. 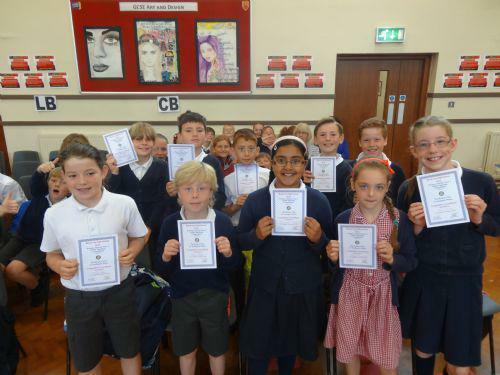 On Monday July 13th we are attending the Public Speaking competition at Meols Cop High School. You are all welcome to attend. This starts at 9.30am, ends at 11.30am and we shall be walking there and back. On Wednesday July 15th we shall be taking part in a heritage walk along Lord Street and a history trail at the Atkinson Museum. Your child will need a waterproof coat and sensible walking shoes. If you would like to come along you would be more than welcome, just let me know in good time for my risk assessment which I carry out one week before the event. Thank you for help with these matters. 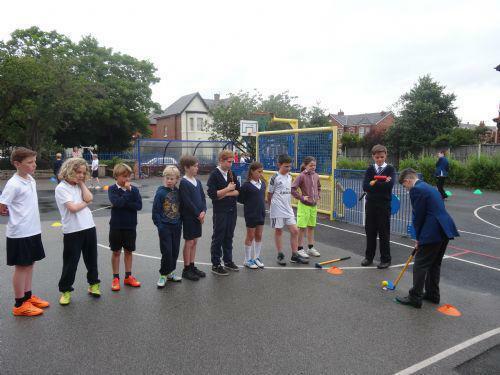 Our thanks got o Birkdale High School for coming along to St Philip's last Friday to teach our children the art of golf. 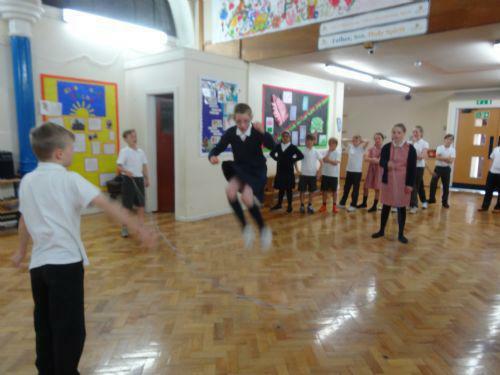 It was a special event to mark our Get Active Week organised by Mrs Parsons. Thanks Miss! The children had a great time and we hope to see one of them lifting the claret jug at the British Open one of these days! Year 3 and Year 5 pupils were delighted to welcome our local Imam from the Southport Mosque last Wednesday. He was very impressed with the listening skills of the children and the quality of questions that had been researched before his visit. Now we shall be getting cracking with designing special information leaflets for our friends in Year 3 to enjoy. 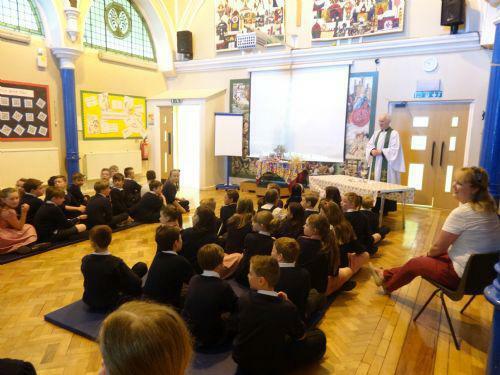 Thank you to Reverend Richard for celebrating a special communion service for Year 5 and 6 pupils recently. It was a wonderful way to recognise the power of Jesus in our lives and it was lovely to see our friends from St Philip's Church who came to join us. Thank you all for taking part in our great Skip-a-thon recently. It was a fun way to get fit and raise money for our school grounds. Your generosity was very much appreciated. 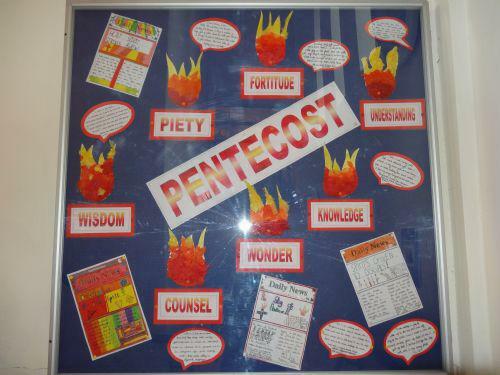 Thank you to Reverend Richard for coming in recently to our class and sharing his thoughts on the amazing events of Pentecost. It inspired us to make a display! 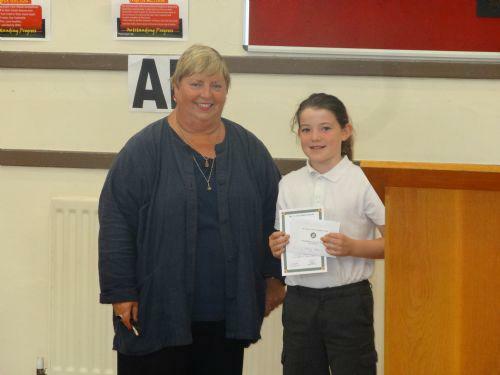 We welcomed Mrs Wheelhouse this week to Year 5. She has started teaching our students the importance of making decisions as we get older. The next few lessons cover Love and Marriage, Puberty and then finally, Aiming for the Best in Relationships. On Wednesday May 20th, Year 5 had a wonderful morning visiting Christ the King high school. We met Miss Peppin who was an expert on Africa. Now we can name loads of countries, rivers, deserts and moluntain ranges! Then we met Mr Short who helped us appreciate what British values are and which ones we would like to aspire to. Our many thanks go to Miss Jamil who helped organised this event and we hope very much to go back again soon! PLEASE REMEMBER YOUR WATER BOTTLE THIS TERM - IT'S GETTING WARM! We had a great day out at Greenbank and Birkdale High School recently. The day was packed with lots of interesting activites including cooking, maths with midget gems, rugby training, art, history, science, and P. E. Our thanks go to all the staff for their time and enthusiasm. It was amazing to see the eclipse live on the big screen in the school hall. Unfortunately ,we were not able to use our special pin hole cameras due to a cloudy Southport morning! 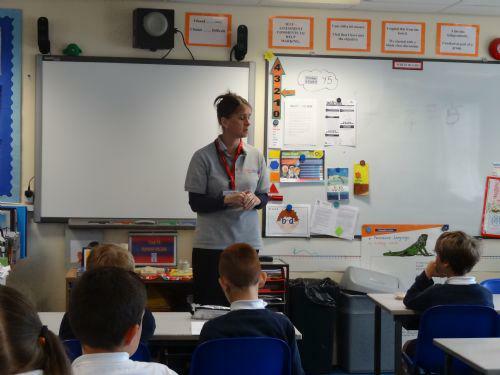 Our thanks to Zoe and Robbie, our local community police officers, who spoke to all the school about staying safe. The children listened carefully to their advice and asked very sensible questions. Now we ALL know how to deal with strangers and how to seek help if we feel threatened. 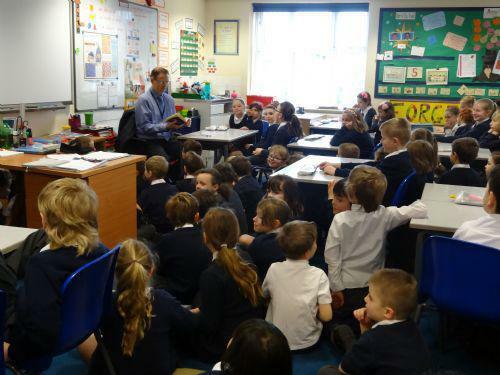 We all had a great time visiting various teachers in school, on March 5th, listening to favourite stories. Mr Travers read 'I'm telling you they're Aliens! 'with an invited audience from every year group. We are having great lessons from our special gymn teacher every Wednesday afternoon. Year 5 designed their own special prayer station on the theme of Forgiveness, in support of the school's Prayer Spaces Morning. We spent ages preparing hearts in the shape of two shaking hands to represent friendship and forgiveness. The idea was to write the initials of someone you want to forgive on the back of a heart then throw them away into the Forgiveness Bin! Let Go - Let God! We then visited all the other prayer stations in church examining the themes of Thankfulness, The World, Me and The Big Question. Now we know everything about the life of Jesus, who he met, the miracles he performed and the amazing events after his death. The children were beautifuuly behaved and learned SO much in such a short time. Many thanks to the super team at Grace Baptist, we look forward to our next visit! 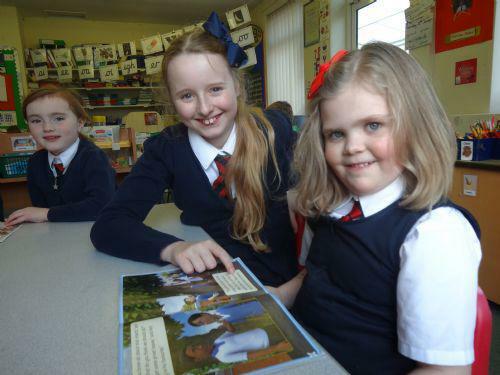 We have really enjoyed helping our friends in Year 1 to read! Some of us go to visit them in Year 1 and others come upstairs to our classroom. We were delighted to welcome Mrs Pointing, the High Sheriff, in December. She plays an important role in the lives of the Royal Family when they visit Southport and Liverpool. We were really pleased to share with her our work on our legend stories and she said that we were super writers! I think we should invite the Queen next year! 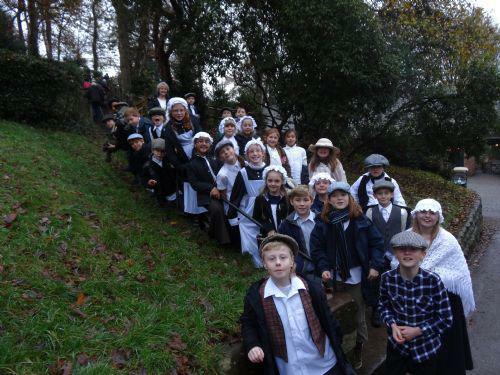 The children thoroughly enjoyed their visit to this old Victorian mill. The bossy teacher in the apprentice house certainly scared the living daylights out of us! It was a great experience because we had fun but also learned SO much! 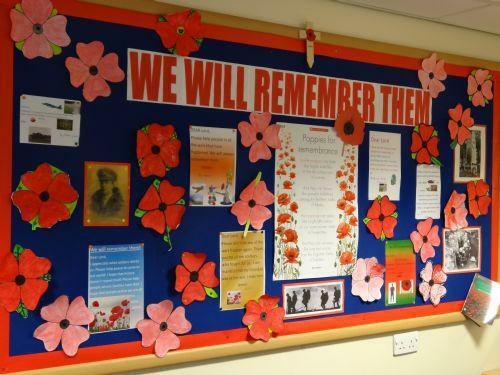 I hope you like the children's display on our Remembrance theme. The children were brilliant at observing the two minute silence, in honour of all those who gave their lives so we could enjoy our freedom. 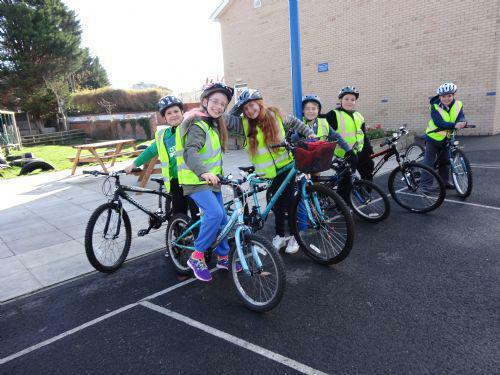 Congratulations to all those who took part in our recent BIKERIGHT training. I know the trainers were very impressed with level of skills and confidence the youngsters showed especially when on the local roads. VICTORIAN VISIT just a reminder to have a look at our photographs from our wonderful day out last December.